This clever world-time clock can display time for all 24 world time zones. A titanium finished, sloped case with brushed aluminum finished front panel supports the two satin silver-finished dials. 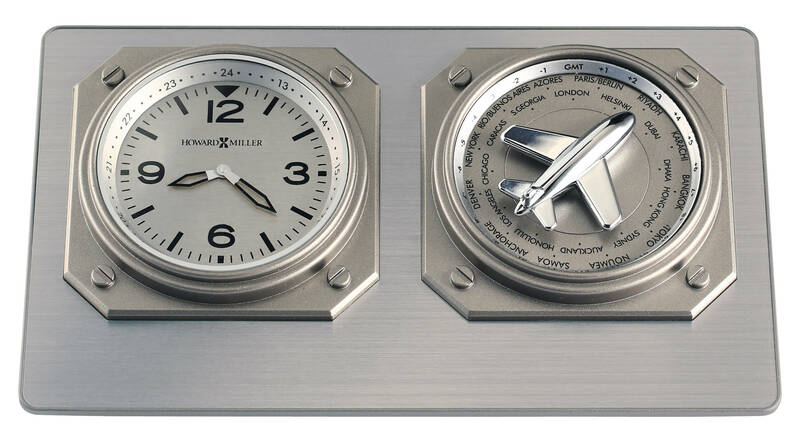 Rotate the polished chrome-finished airplane on the right dial to point at one of the 24 world cities and the clock hands on the left dial move to show local time for the selected city. The left dial features a silver-finished 24 hour ring that frames the black Arabic numerals, hour markers, minute track and hands, all beneath an acrylic crystal. Quartz movement includes two AAA batteries. 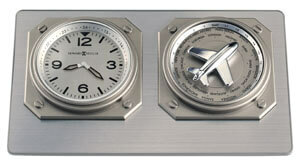 You will save $25.20 (30 %) on this Howard Miller Aviatrix 645-765.